Since his unfortunate sudden retirement back in 2011, the man we know as Adam “Edge” Copeland was lucky enough to have found a second career in acting. When you think about it, it’s only natural—the best wrestlers are but only the best actors. If you’ve got someone as talented in character work as Edge, it shouldn’t be surprising that he’s transitioned so easily to the other side of the screen. Edge’s mainly starred in the SyFy series Haven as Dwight Hendrickson, a guy who apparently attracts bullets. 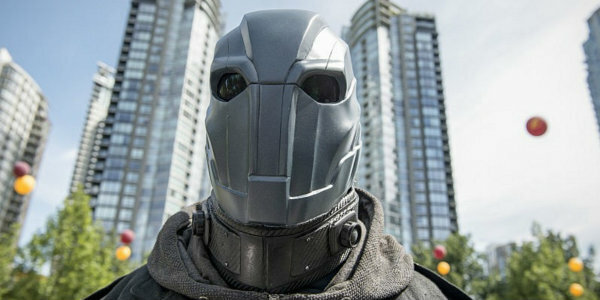 Last week, however, his young acting career took a step up as he helped open the second season of The Flash on the CW, guest-starring as a new villain, Atom-Smasher. Now, Smark Henry editors Stan and Ro are huge Edge and Flash fans, so you can bet they were pretty excited to watch his turn on the show. And because they’ve got time, today they run a quick review of Edge’s portrayal of Atom-Smasher. Ro: Okay, I’m going to say it right off the bat—I was disappointed. We know what Edge can do as a character, we know how the show can be, and we even understand that he was just written to be the supervillain equivalent of Roman Reigns (or probably even Braun Strowman) and he was just playing that role to a tee, but I just wanted more. Is it possible that I—well, we—are just fanboying and marking out a little too much here? It’s like waiting all day to go see a live wrestling show and catching all these awesome spots, but you get a mat-based classic instead. Edge’s good for what he’s trying to pull off, but I guess I wanted to see him pull something else off. Maybe it’s the wrong character for him? Stan: I’m not sure if it was a matter of the character being wrong for Edge or a matter of the character not being fleshed out enough. I did my fair share of googling Atom-Smasher and now that I know that Al Rothstein is actually supposed to be a hero, maybe the multiverse aspect of the Flash could bring him back as a hero instead of as a Rogue. As pessimistic as I tend to be, I hope that all that hype surrounding Edge’s entry into the Flash’s cast leads to a second appearance. If it doesn’t, then you and I will have enough reasons to be disappointed. Ro: It’s like what I said on this week’s episode of the podcast, though: even though anyone, you or I in his shoes, would take up the offer just to be on the show, I don’t think he’d say yes if it were just a one-episode deal. He’s got to come back. I really just don’t think the strong-and-silent type was the right role for him. His track record has proven that he works best as a blabbering maniac. Stan: Plus the show thrives on witty one-liners and brilliantly written dialogues. It’s something Edge would have been a perfect fit for. Taking the first episode of season 2 out of the equation, though, who would you re-cast him as? Ro: I honestly don’t have the best idea as I’m really more of a Marvel guy than a DC guy, but I think he would’ve been perfect as a hero instead of a villain. (This is probably why they gave him a guy who was originally a hero, and rewrote him to be a bad guy.) Just hearkening back to the times of old E&C, I think he could make a good Booster Gold. Within the show, though? If Heat Wave hadn’t already been cast, I wouldn’t mind him as that. Or… hell, this is asking a lot, but why not have him be Jay Garrick? Stan: Yeaaaah, I think casting him as Jay Garrick might have been too much to ask. I haven’t seen Teddy Sears’ work outside of his lone appearance as Jay Garrick thus far, but I have a feeling like they have a great one in him already. I am really holding on to the possibility of the Atom-Smasher being rewritten into the show somehow. Something tells me that the show’s producers won’t knowingly cast Edge as a one-off character who ends up looking like a total jabroni against the Flash. In any case, we’re done with week 1 of the Flash, and regardless of whether or not Edge comes back, I’m excited to see what lies ahead for Team Flash! Having the Rated-R Superstar (or any other actor with ties to wrestling) is a damn good bonus. What do you think, Flash and wrestling fans? Did you like Edge's turn as the Atom-Smasher?